The first CSI5* class of the Longines Global Champions Tour of Miami Beach kicked off in style with a win for Germany's Philipp Weishaupt and his bay mare Sansibar. 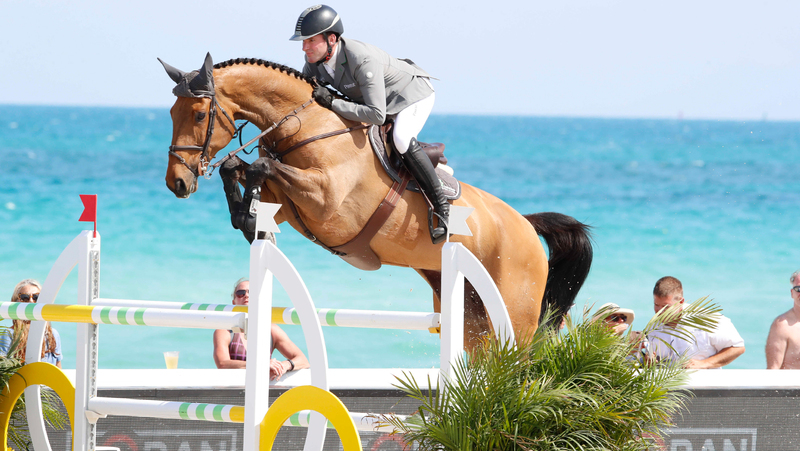 Set against the breath-taking backdrop of the Atlantic ocean, a wide variety of tactics were on display during the first class, with some riders opting for steady rounds in the 1.45m contest, while others used the opportunity to test their horses’ speed in the beautiful arena. 60th to go out of the 67 starters, it was Germany’s Philipp Weishaupt who left the rest of the pack trailing. The class was a two-phase, meaning any combinations clear over the first eight questions progressed straight on to complete the full round of 13 fences. Although Weishaupt began at a fairly sedate pace on Sansibar, a rangy, scopey 12-year-old Hanoverian mare owned by Kamal Bahamdan and Henrik von Eckermann, he cranked up the speed as the round progressed. Their winning visit culminated in a gutsy leap at the penultimate fence — a wide, airy oxer — where the Stakkato Gold x Wolkenstein II son stretched, extended and flicked his hindlegs away to clear it, before landing and galloping fast to the last. Double clears were few and far between in the first third of the class, though 21 combinations ended up clean and without penalty over all 13 fences of Italian course designer Uliano Vezzani’s track. Clear rounds ranged hugely in time, but Weishaupt’s 21.8 second attempt proved unassailable and he picked up the winners’ prize. He snatched the top spot from the long-time leader, American rider Georgina Bloomberg and Gotham Enterprizes’ 11-year-old Paola 23 — another mare. They finished second in 21.89. The podium was rounded out by Canadian Olympian Eric Lamaze, who posted a 22.14-second double clear on Chacco Kid — a 12-year-old grey gelding by Chacco Blue. Chasing the podium pack with a strong early showing in the opening five-star contest at the 2018 LGCT Miami Beach were France’s Julien Epaillard (fourth on Instit de Jacuso), the Netherlands’ Leopold van Asten, who finished fifth on VDL Groep Beauty, while. Belgium’s Jos Verlooy rounded out a truly international top six riding the 11-year-old Herald van’t Ruytershof.